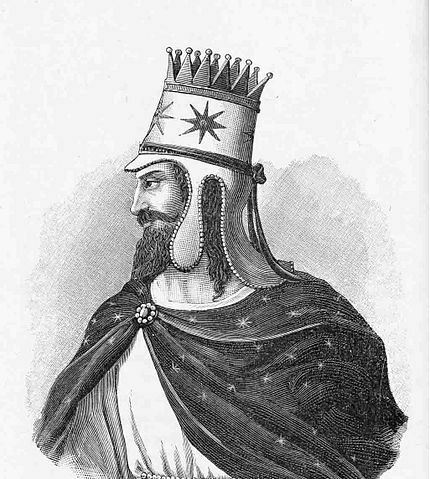 Artaxia I was the founder of the Artaxiad Dynasty whose members ruled the Kingdom of Armenia for nearly two centuries. Artaxias was originally appointed strategos of Armenia by Seleucid King Antiochus the Great, but following his monarch's defeat by the Romans at the Battle of Magnesia in 190 BC, Artaxias and his co-strategos Zariadres revolted and, with Roman consent, began to reign autonomously with the title of king; Artaxias over Greater Armenia and Zariadres over Sophene/Lesser Armenia. Artaxias was married to Satenik, daughter of the king of Alans. They had six sons: Artavasdes (Artavazd), Vruyr, Mazhan, Zariadres (Zareh), Tiran and Tigranes (Tigran). He was succeeded by Artavasdes.